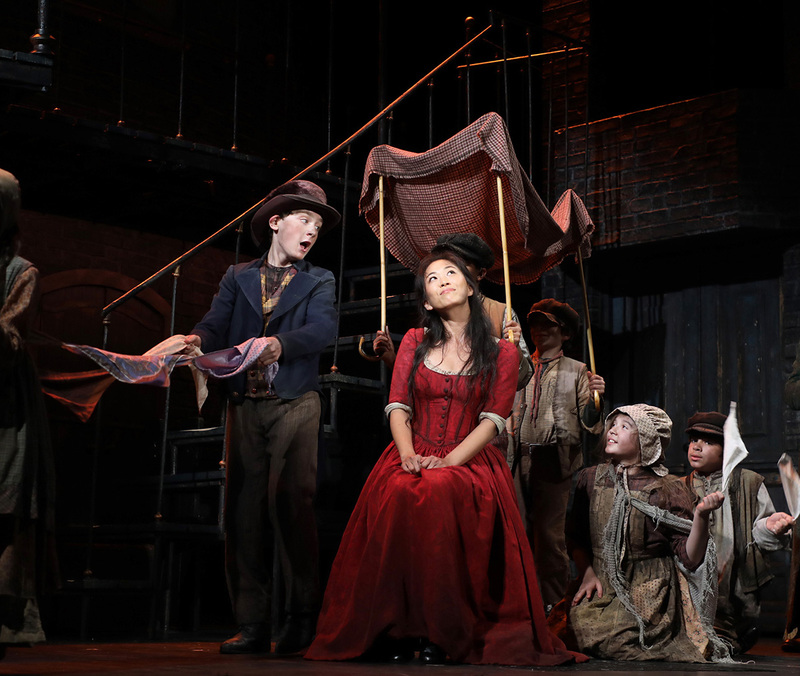 EAST HADDAM, Conn. — Goodspeed Musicals’ impressive production of Lionel Bart’s Oliver! isn’t shrouded in darkness and dismay. But, make no mistake: This mounting is unlike the buoyant, multi-award-winning 1968 film adaptation of Charles Dickens’ novel, Oliver Twist. Rather, Goodspeed’s version, like David Lean’s 1948 noirish, severe, non-musical film version, more vividly communicates the shady underworld and bleak atmosphere in Victorian England that the destitute encountered and social reformer Dickens regularly wrote about in Victorian England. As a result, you worry more for little Oliver’s well-being. It’s safe to say that Dickens would’ve been pleased with Goodspeed’s production. It runs through Sept. 13. 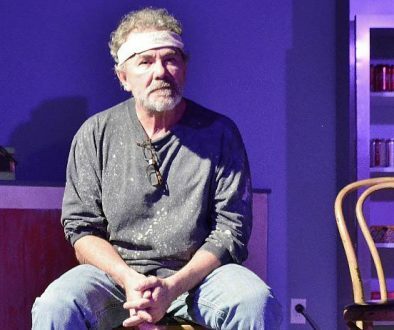 Rob Ruggiero’s detailed, sensitive direction, coupled with strong technical work, complement almost uniformly strong performances by a large cast. It includes not just boys among the children, but girls as well. The tone Ruggiero sets is important. When we enter the 398-seat theater, we’re drawn into scenic designer Michael Schweikardt’s dark depiction of 1830s England. His two-level set features a dreary, blackish-grey hue. Jail-like bars enclose what resembles a pitch-black room. Meanwhile, dark-hued, steel-like, rust-stained, closed doors stand upstage. Still, there’s contrast and symbolism in the set. While the downstairs level of the two-floor structure contains no outside glimpse, a pair of upstairs windows offers exactly that. Through them, we see a bright sky. So, the symbolism is clear: Oliver faces an “up-hill” battle for light, hope and love. Still, before we can experience a strong cathartic release, we must experience Victorian England’s severe landscape. Indeed, the more dismal and seemingly hopeless the surroundings are, the stronger the relief will feel at the end. And so, Ruggiero begins the show similarly to how Dickens began his novel: before Oliver’s birth. We watch as Oliver’s dying biological mother appears from below the stage, as though arising from some pit. A foreboding, chilling, thunder-like noise suddenly erupts. Mom, obviously in grave health, lies down and dies. Then, we hear pounding foot-stomps from the shoes of children, holding empty, unsightly bowls. In a somber than dreamy tone, they sing the gloomy and then hopeful song, “Food, Glorious Food.” As the song progresses, its pace quickens and becomes more lively. Although the voices belonging to these workhouse orphans aren’t at first particularly loud, some may say it’s understandable. Surely, they lack energy, having been on a steady diet of thin gruel for who knows how long. But the notion of dining on delicacies seems to give them a second wind. Their thoughts come to life in song, as they dreamingly sing about a menu befitting royalty. The dusty, rag-clad orphans displaying empty bowls differ markedly from the salivating parish beadle Mr. Bumble (a pompous, commanding and fearsome Richard R. Henry). He’s seated at a fancy tablecloth-covered setting, enjoying a feast the children can only dream about. Certainly, Dickens wished to point out the gulf between the rich and the poor. Through his smart staging and spacing, Ruggiero illustrates this in a single scene. Also, the director creates tension between happy scenes and gloomy ones. No doubt, John Lasiter’s lighting, Alejo Vietti’s costumes, Schweikard’t set changes and Dan DeLange’s varied and vibrant orchestrations reinforce these contrasts. The tension between brightness and darkness is palpable. The result, as we watch, is intense friction, keeping us riveted to the stage and rooting on everyone’s favorite male orphan. But good and evil aren’t absolutes in Oliver! 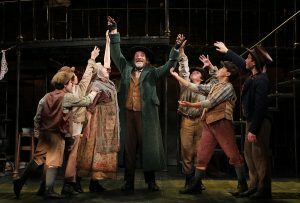 Sure, Fagin and his youthful band of pickpockets are hardly saints. Still, they offer Oliver a home and a sense of belonging. Most likely, fans of the film will remember the late actor Ron Moody’s vivacious, award-earning performance as Fagin. However, Donald Corren’s portrayal differs noticeably from Moody’s. The latter, without resorting to Dickens’ Jewish stereotype or caricature, endowed the character with a conniving sneakiness. Naturally, Oliver’s demeanor brightens considerably, at least during his early period with Fagin and his pickpocket pupils. 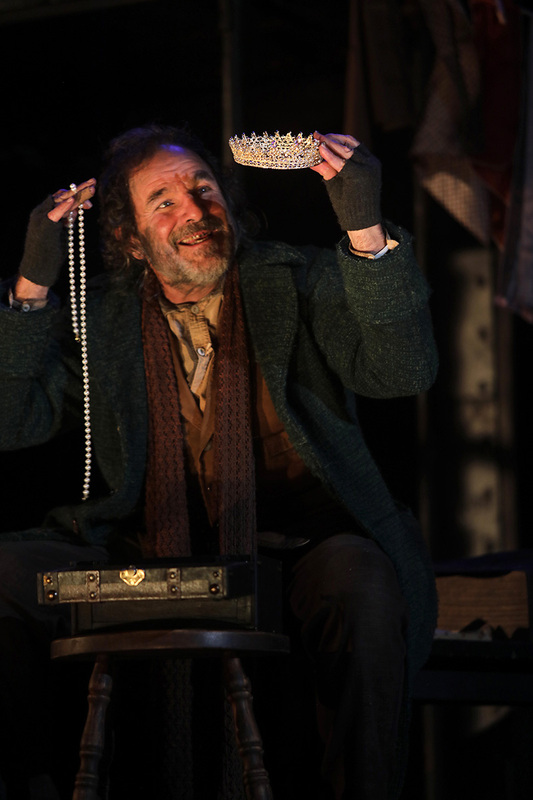 Meanwhile, Oliver has a positive effect on Fagin. The young boy’s inherent goodness forces the old man to re-think his life. 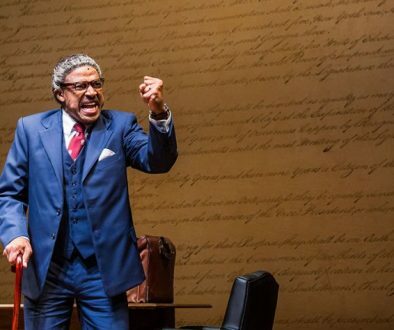 He does so during the patter-like, tongue-twisting song “Reviewing the Situation.” But is it necessary to have a violinist shadow Fagin during the song, just like one does to Tevye in Fiddler on the Roof? 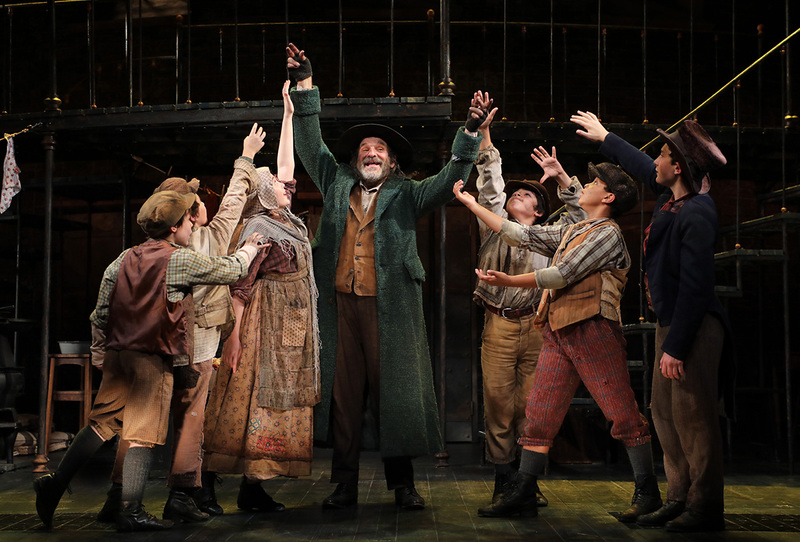 In fact, it’s a slap in the face that in this production, the criminal Fagin, kindly as though he may be here, is compared to a pious man such as Tevye. 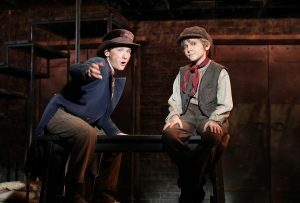 With that out of the way, Corren’s Fagin deftly sings “Reviewing the Situation” at cheetah-like speed, without missing a beat. Meanwhile, with telling facial expressions, the actor imparts Fagin’s thoughts. No doubt, throughout the musical, his thoughts turn to the brutish bully Bill Sykes. In the movie, a hulking Oliver Reed played him with teeth-chattering, understated menace with no redeeming qualities. Undoubtedly, the imposing Brandon Andrus plays the bully similarly. But here, Ruggiero has softened Sykes somewhat. This becomes manifest in Sykes’ sometimes charming smile. This expression can help explain “girlfriend” Nancy’s long-time attached to Bill. 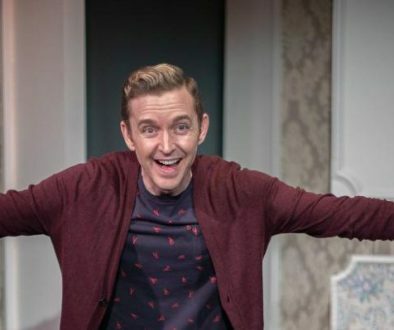 In addition to the womanizing, taunting Mr. Bumble, Sykes is part of this musical’s Me Too problem. He hits, threatens and kills Nancy. 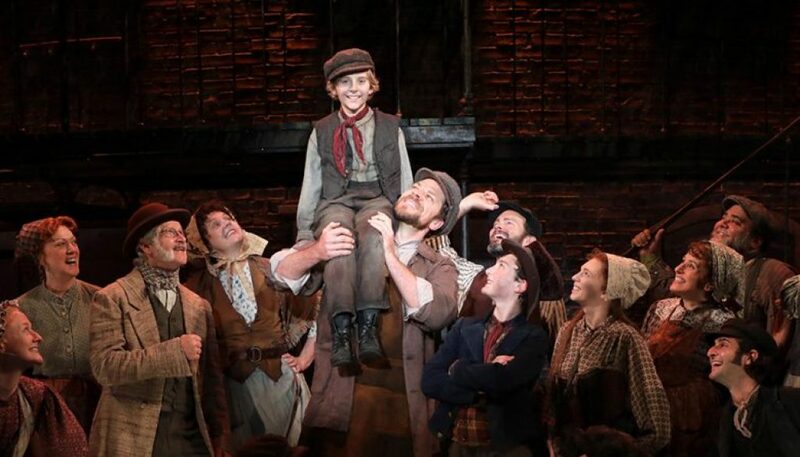 Some might say, with the woman-empowering #MeToo movement growing stronger, this isn’t a time for a production of Oliver! Indeed, similar questions have arisen over current Broadway productions of My Fair Lady and Carousel. Fortunately, we see no fake blood, marks or bruises on Nancy. Also, it’s clear that Bill isn’t actually beating her to death. 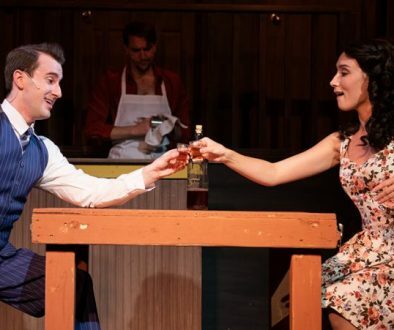 Speaking of Nancy, the production’s answer to the show’s Me Too dilemma rests, in part, on EJ Zimmerman’s rendition of “As Long as He Needs Me.” She sings it as though it’s clearly her decision to stay with Bill. She belts the song with fortitude and self-confidence, daring anyone to keep her away from her boyfriend. All this suggests a self-empowered Nancy, who bravely tries to protect Oliver from this bully. Regarding the boy, Elijah Rayman possesses the requisite purity, adorability and inherent goodness. Still, Rayman could infuse more emotion into “Where is Love,” perhaps shedding a tear or two. At the same time, he conveys the necessary fight-back demeanor when he’s taunted to the point that he can take no more. Also, to the lad’s credit, toward that scene’s end, tearfulness becomes apparent after Bumble sells him to an undertaker. You may recall that, in the 1968 musical film, Jack Wild lent the character a jolly, free-spirited, thoughtful and convivial nature. But, all these characteristics did little to suggest “The Dodger” was a criminal in the making. In a departure from Wild, Gavin Swartz projects a more understated, darker Dodger. While there’s an artfulness about him, Swartz offers a more vigilant, wide-eyed, even shady-eyed character. There’s a look in his eyes that suggests he’s up to something — and there’s nothing pure about it. Even so, Swartz’ Dodger places a seemingly protective arm around Oliver’s shoulder. In general, the young actors hold up well with their adult counterparts, acting-wise and musically. Meanwhile, a vibrant and versatile orchestra accompanies. Under musical director Michael O’Flaherty, sometimes the musicians adeptly play variations of the same song using different keys and chords and dramatically altering mood. For instance, the orchestra plays at least one happy, upbeat song in a harsh, foreboding tone during a scene involving danger. Challenges that Oliver! presents, including casting so many children, have resulted in infrequent productions. The last Broadway revival was more than 30 years ago. That’s a shame, for several reasons. This show mirrors life, with its moments of despair and brightness. Also, Oliver!, in addition to its compelling quality and memorable score, offers hope. It’s a hope best expressed in “You’ll Never Walk Alone” from Carousel. Oliver! continues through Sept. 13 at The Goodspeed Opera House, 6 E. Main St. in East Haddam. Ticket prices vary. Showtimes are 2 p.m. and 6:30 p.m. Sunday, 2 p.m. and 7:30 p.m. Wednesday and Thursday, 8 p.m. Friday, as well as 3 and 8 p.m. Saturday. To buy tickets, call (860) 873-8668 or visit www.goodspeed.org.